We’re on our third Oster Electric Wine Opener and we wouldn’t go back to anything else. Hearing people talk about wine openers, is like getting everyone on the same page about a particular wine. Some love it, some hate it, some are apathetic about it. Wine openers are similar. Some prefer the old manual corkscrew method. Boring and not always easy. Some love the “rabbit”. Better than a manual corkscrew, but not exactly space saving. The Rabbit also has lots of moving parts that seem to get weary over time. You know it’s never good when they ship spare parts with the opener. The Oster Electric Wine Opener works like a dream. The opener can be used with just a touch of the button. No balancing acts. No acrobatics. Place the wine opener over the bottle (after the foil has been removed, of course), touch the button and in just a few seconds, voila. It works perfectly on any type of cork. Plastic or otherwise. The opener accommodates to most sizes of wine bottle openings. Over the years, we’ve only had two or three that had abnormally large openings, where we had to get out the old style corkscrew opener. While it won’t fit in a drawer, it easily fits in any cabinet or on the countertop. The charging base is small, so it’s unobtrusive. The wine opener’s charge lasts for at least 10-12 bottles, so it’s ready for a party if need be. 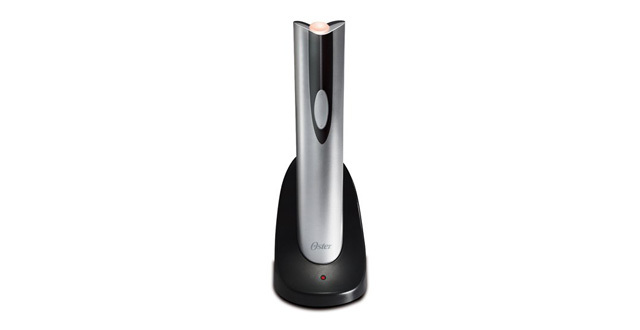 While the Oster Electric Wine Opener is available in various versions (think stainless steel, colors and more), the plastic model is the least expensive with the same mechanics. Occasionally, if you have a bad or dry cork on a wine bottle, you may end up with “cork bits” in the housing. They almost always come out with a little cajoling while pushing the button on the wine opener. Our Oster Wine Opener lasts for about three years before it needs replacing. The irreplaceable, rechargeable batteries give out long before the mechanics of the opener. But at an average price of $15, you get a lot of wine bottles opened over three years. And, at an average price of $30-$50 for the “rabbit”, that needs it’s parts replaced far more frequently, it’s a much better buy. Start making wine opening effortless. Give the Oster Electric Wine Opener a try.